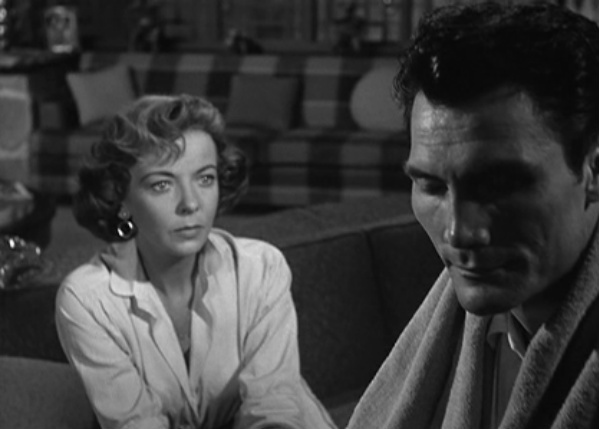 Jack Palance stars as Charles Castle, the star of schlock cinema who’s grown tired of the B-movie racket. He’s looking for something more real, more juicy. His Hollywood lifestyle has caused a rift between him and his wife, Marion (Ida Lupino). On the verge of leaving, a renowned writer has proposed to her. This revelation causes Castle to plead for her hand again, saying he’ll refuse to renew his contract if it means they can be together. The studio head, Stanley Hoff (Rod Steiger), and Castle’s press agent, “Smiley” Coy (Wendell Corey), don’t take too kindly to his decision. Hoff is a cartoon-like hot head, who screams and growls at Castle like an animated drill sergeant. “Smiley” is more icy and calculated. This demeanor, deliciously delivered by Wendell Corey, provides more goosebumps than Palance – something you don’t hear everyday. While Hoff and Smiley gleefully chew the scenery, it’s their characters that propel The Big Knife into the realm of the unreal. These two guys take it WAY over the top. Hoff is like a cartoon and Smiley is like a rich super villain. In the constraints of this little chamber play, they really take away from the drama. When Castle tells them he doesn’t intend to renew his contract, Hoff and Smiley blackmail him with a nasty bit of information they have on his past. This kicks into motion an ugly spiral of desperation, lust, and fatalism – the trademarks of any noir worth its weight in grit. But The Big Knife sensationalizes the proceedings with melodramatic anchors that drag the picture down. Shelley Winters enters as Dixie Evans, a struggling actress dangled in front of Castle’s face, which is another cause for the narrative to saunter towards its end. Then Castle, tortured over the contract, finds relief by flirting with a friend’s seductive wife. More heel dragging. At least Palance’s depiction of Castle is nicely layered. He’s a pampered pretty-boy whose personal assistant gives him rub downs and mixes him drinks on command. On the inside, his soul is crumbling away under the thumb of the studio system. His performance may be the sole thing that makes The Big Knife worth the watch. Typically I’d give some of that credit to Ida Lupino (Road House), but she’s terribly underused here as Castle’s wife. Moments that she is on the screen, she delivers a subtle, heartfelt performance. 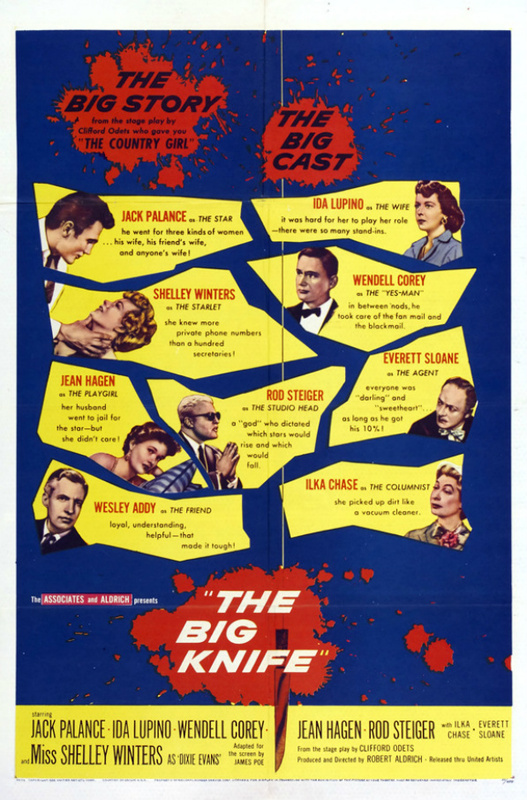 Robert Aldrich struck noir gold the same year as The Big Knife with the undisputed classic Kiss Me Deadly. It’s a shame lightning didn’t strike twice in 1955 for him. But like I said, this one’s worth watching for Palance’s performance, and you can currently do so on Netflix streaming.